Thursday evening saw another running of the S4/10 Time Trial in Buckfastleigh, run by Mid Devon Cycling Club. Warm weather, light winds and low pressure hinted that this could be a very fast night for some. Ninety riders on the start sheet included a great showing of eight riders from Revo Racing. 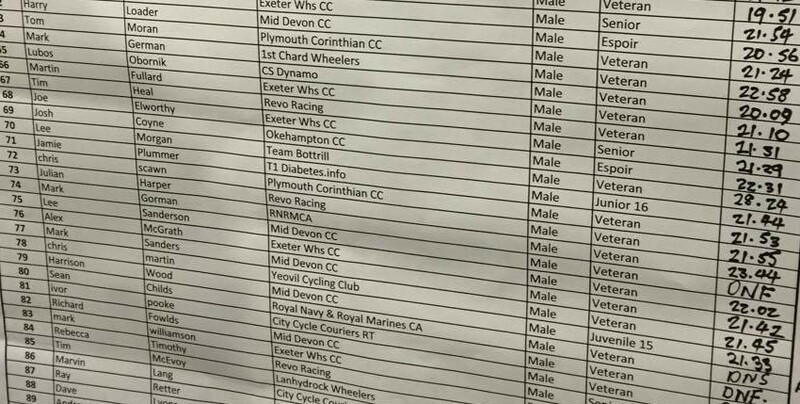 By the end of the evening, a new course record had been set with a stunning time of 19:12 by NOPINZ rider Dean Robson, with Conrad Moss (MDCC) also breaking the old course record and finishing in second place with an impressive 19:28. Some great performances by the Revo team, with an especially great showing by John Nolan, improving his personal best time by a significant margin!